AVALON — After years of visiting Avalon, San Clemente residents Milton and Wanda Stone began making notes about things that could make their trip easier. “Over the years of visiting different harbors and places, we found a shortfall and a need for this,” said Milton Stone, who cruises along California’s coast in a 40-foot Sea Ray. 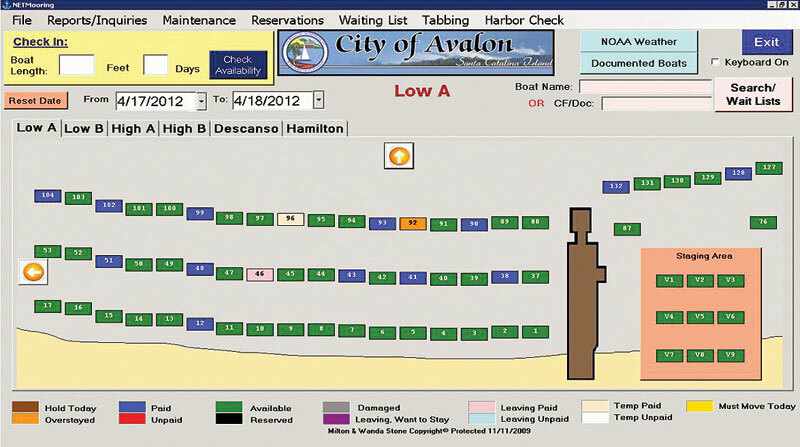 What the husband-and-wife business team developed was a computerized system that has been custom-designed for Avalon’s mooring field, streamlining visiting boaters’ check in process and allowing Avalon Harbor Patrol staff members access to real-time mooring availability information, to put boats on moorings quicker than was ever before possible. Avalon Harbormaster Brian Bray said he couldn’t be happier about the change. Touch screens have been installed on each Harbor Patrol vessel, giving each boat the same up-to-the-minute mooring availability information. That means visiting boaters will receive immediate and accurate information on how many moorings are available — including what size, and for how many nights. The new program started operation March 10. Bray said, so far, the system has been working exactly as it had been described. The Stones’ company, called Net Moorings, was started just four years ago, when Milton and Wanda Stone copyrighted their program and code. Avalon is the first harbor to fully implement their system, utilizing Net Moorings software and suggested hardware to run the program. With the new program in place, boaters will now be able to pay their mooring fees with a credit card. The old system only allowed cash or check payments. Bray said the new system should reduce the number of errors that came from handwritten receipts and logs, inherent in the 25-year-old system. Under the old system, a boater would enter the harbor, where he or she would be greeted by a patrol boat stationed there. The patrol boat would call the harbor staff patrolling the mooring areas to find a spot for the vessel. Once the a mooring was assigned, staff members would radio in the boat’s size, CF number and length of stay to another patrol officer. That officer would then write the information in the harbor log, before reentering the same information into the computer. Stone added that the time Harbor Patrol staff spends on managing mooring assignments will be greatly reduced, since their boats will have access to exactly what is available in the harbor — on their computers. “We still have patrols assigned in the different areas of the harbor along the 30-, 40-, 50- and 60-foot rows — but all they are doing is going in and collecting (fees) from someone who wants to stay another day or clearing a mooring. And the guy at the entrance (automatically) sees what’s cleared and is able to assign it,” Bray said. The change came following last year’s mooring reservation system implementation at Catalina’s West End. Boaters visiting Two Harbors can now go online and reserve a mooring site for the weekend, if it is not being used by the mooring permittee. But Bray said that Avalon has kept its mooring assignments on a first-come, first-served basis for visitors, which allows mooring owners more flexibility. For example, Two Harbors’ mooring permitees must call in the Thursday evening before the weekend to reserve their mooring, but Avalon’s mooring system is set up to allow for mooring owners to call in by midnight the night before heading over to reserve their mooring. Stone said that the Net Moorings system is flexible enough that if the decision was made in the future to implement a mooring reservation system, the company could easily make the change. Since installing the Avalon system, Stone said two other harbors in California have begun looking into the Net Moorings system, and one prospective marina in Florida has contacted the company as well.